Piqua’s Zach Tillman pulls down a rebound between Fairbo Shaunn Monroe (3) and Jarod Bodekor (23) Tuesday night at Garbry Gymnasium. 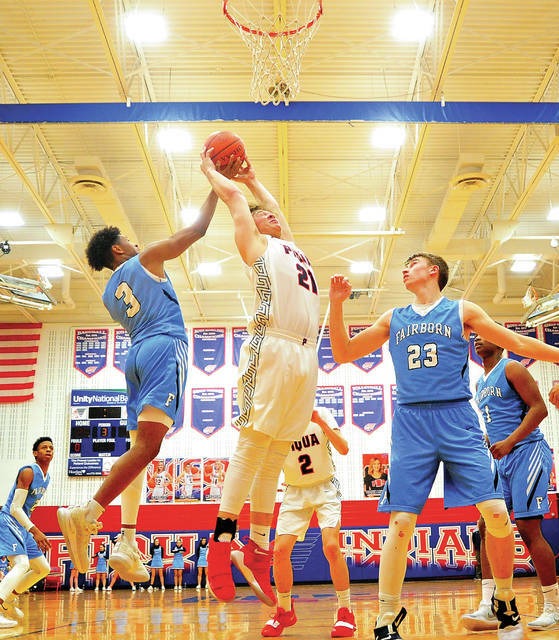 Piqua’s Garrett Schrubb (14) makes a leaping pass to Mick Karn Tuesday night against Fairborn as the Skyhawks Jarod Bodekor defends on the play. Piqua’s Iverson Ventura gets off a jumper Tuesday night against Fairborn. Piqua’s Mick Karn dribbles between two Fairborn defenders Tuesday night at Garbry Gymnasium. 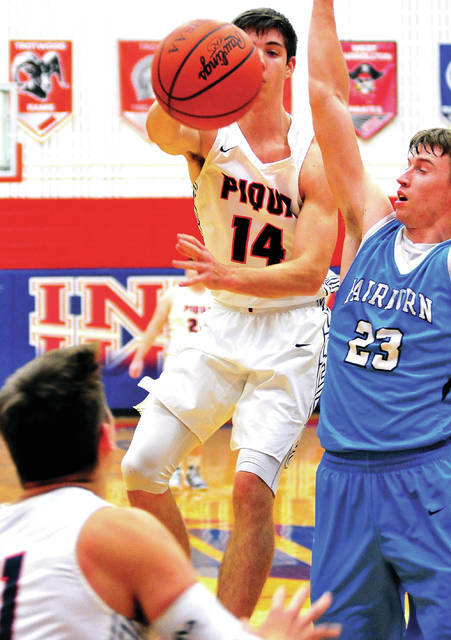 Piqua’s Trey Richmond shoots over Fairborn’s Jarod Bodekor (23) and Otis Person III Tuesday night. 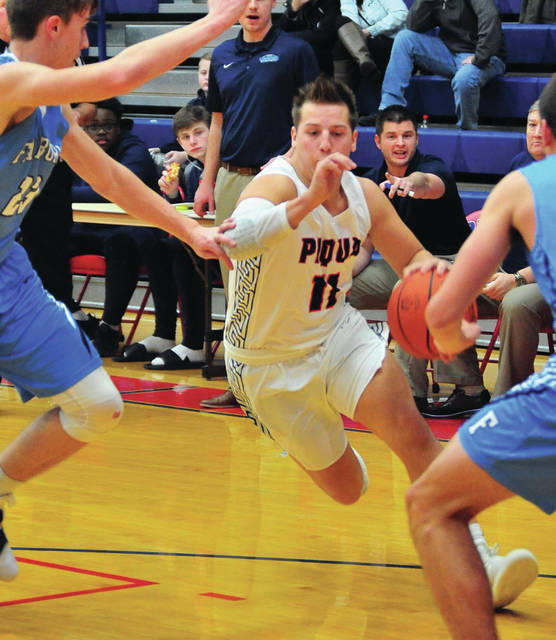 For the Piqua boys basketball team, Tuesday night was a night of doing a lot of things right — including sophomore Kameron Darner’s best game of the season. But, the Indians dug themselves a 16-point hole in the third quarter, before a big comeback came up just short in a 64-54 loss in GWOC American action. Piqua dropped to 5-9 overall and 2-7 in GWOC American play, while Fairborn improved to 10-4 overall and 7-1 in GWOC American play. The Indians got off to a 4-0 lead on baskets by Zach Tillman and Trey Richmond. 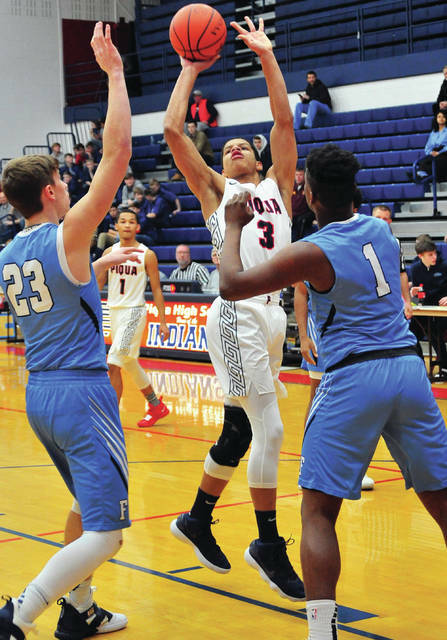 But, Fairborn would score the next 13 points and go on an 18-2 run, before Piqua countered with four points on two baskets by Iverson Ventura to close within 18-10 at the quarter’s break. Mick Karn had assists on two of Piqua’s five baskets in the quarter. In the second quarter, Fairborn opened a double-digit lead, but Piqua rallied. Darner and Riley Hill hit from long range and when Tillman scored on a putback, the Indians trailed just 28-25 with a little over two minutes remaining in the half. But, Fairborn’s Joe Nickel would score five points in the last 1:05 of the half to give the Skyhawks a 34-25 lead at the break. Shaunn Monroe took over for Fairborn in the third quarter, scoring 12 points as the Skyhawks opened a 48-32 lead with 1:40 remaining in the quarter. But, Piqua answered with the final seven points of the quarter to get within 48-39. Trey Richmond hit a three. Then, after a foul and technical foul, Hill and Qurri Tucker each hit one of two free throws. Hill added a basket to cap the third quarter scoring. Piqua added the first three points of the fourth quarter on a Ventura basket and Hill free throw to make it 48-42. A Tucker basket at the 5:00 mark got Piqua within 49-44, before Nickel answered with a three for Fairborn. Tillman scored on a bullet three-quarters quart pass from Karn and Darner hit two 3-pointers as Piqua got as close a 58-52 with 1:45 to go —- but the Indians could score only two points the rest of the way. 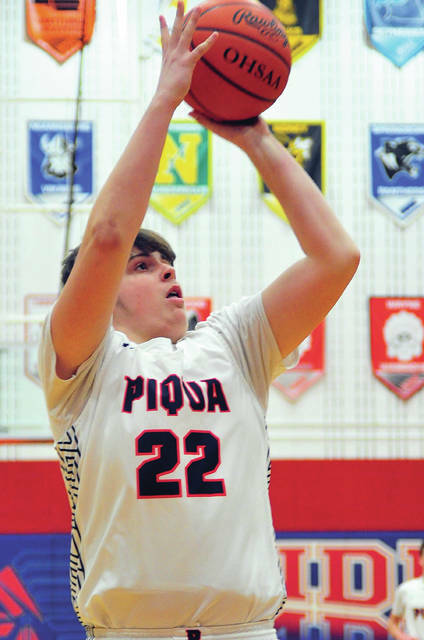 Darner led Piqua with 11 points, while Tucker netted 10 and Richmond had seven points and seven rebounds. Ventura —- back from injury —- and Hill combined for 16 points off the bench. Ventura scored nine and Hill added seven. Monroe paced Fairborn and led all scorers with 29 points, while pulling down seven rebounds. Nickel added 18 points and eight rebounds and Jarod Bodekor grabbed five rebounds. Piqua was 21 of 51 from the floor for 41 percent and five of 13 from the line for 38 percent. Fairborn was 21 of 45 from the floor for 47 percent and 14 of 18 from the line for 78 percent. Fairborn won the battle of the boards 27-22 and had 11 turnovers to Piqua’s 13. Piqua will be back in action Friday, going to Stebbins. Otis Person III 2-0-4, Tylan Eatmon 0-6-6, Shaunn Monroe 10-6-29, Joe Nickel 6-2-18, Jarod Bodekor 2-0-4, Jared Bates 1-0-3, Dwight Lewis 0-0-0. Totals: 21-14-64. Qurri Tucker 4-1-10, Kameron Darner 4-0-11, Trey Richmond 3-0-7, Garrett Schrubb 1-0-2, Zach Tillman 3-0-6, Mick Karn 0-2-2, Riley Hill 2-2-7, Iverson Ventura 4-0-9. Totals: 21-5-54. 3-point field goals — Fairborn: Monroe (3), Nickel (4), Bates. Piqua: Tucker, Darner (3). Richmond, Hill, Ventura. Records: Fairborn 10-4 (7-1), Piqua 5-9 (2-7). Reserve score: Piqua 73, Fairborn 72 2 OTs.